Modular Printing to Avoid Support — . I decided to model some custom pawns for Film Tycoons this weekend. The "old fashioned" film camera might be the most iconic (non-copyrighted) symbol of American film, so it's the most obvious pawn choice. It also has a very pleasing silhouette; you glance at it and know immediately what it is. That outline structure causes some 3D printing issues, though -- there are a lot of unsupported overhangs at angles which can't be printed. Quick lesson for those who aren't familiar with 3D printing: an unsupported section is any bit of plastic which does not have plastic directly beneath it. Consumer grade 3D printers work by laying down layer after layer of plastic. (The layers in these pawns are .2mm tall.) The layers can gradually shift as the print builds; up to a 45 degree incline is quite safe and you can get even steeper if you print slowly. Hence, the tripod legs will print with no problem. One way to handle this is by printing support. 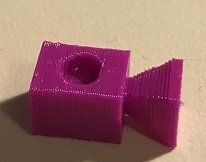 The slicer (the software which translates a 3D model file to code for the 3D printer) can add in columns of plastic with a more diffuse density and a weak connection to the layer being supported. The support columns break off easily from the part. 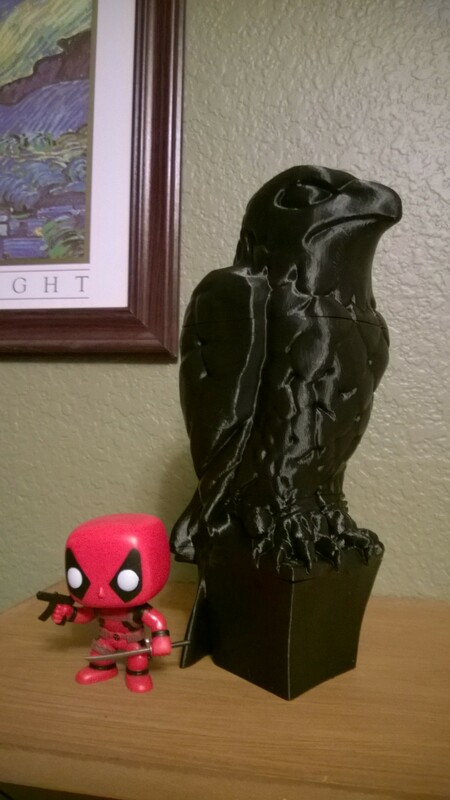 However, supports increase the overall print time, they can leave rough spots on the surface of your model, and they can increase risk -- if the support doesn't have a wide base it can break away from the print bed and cause your print to fail just as easily as the finished part itself. Instead of printing one solid part with support I decided to cut my model into three pieces, each of which could be printed with no support, then glue them together. From the base to the connecting point on the tripod was one logical piece, the camera body and lens are another, then the reels. I hate gluing flat pieces together, though. No one wants to hold two pieces together for ten minutes while the glue dries, right? Especially if there are two gluing operations per pawn and I'm printing six pawns. That's...a lot of time that I could be playing Ruzzle. The answer: pegs and holes. (Ikea figured this out a long time ago, too.) The camera housing has a hole on both top and bottom. the tripod and reels each have a peg. Besides making the gluing easier, this helps ensure that the pieces are aligned the correct way. I actually turned this 90 degrees to the left for printing, so that the lens pointed straight up. A couple of other interesting production notes. First, the to make the peg/hole arrangement really work well, the holes should be cylinders with different diameters at the ends. In this example my pegs have a diameter of 4.5mm. The holes have a diameter of 5mm at the opening and 4.6mm at the back, providing a snug pressure fit. The pieces actually stay together pretty well without any glue. Second, note the orientation of the housing -- I printed it with the back side flat against the print bed, lens pointing up in the air. Why? The peg holes have a 90 degree overhangs. The one on the bottom could potentially sag during the print. Probably not a big worry in this case because the widest of those "roofs" is only 4.6mm, but it's still a good practice. Sometime soon I'll post the OpenSCAD file for this model either here in my site or on Thingiverse.